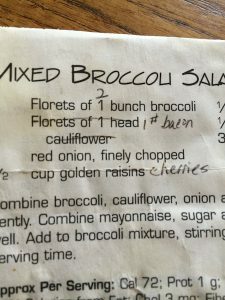 Old School Broccoli Salad – Damn Life is Good! Sometimes, you just need a salad. Other times, you need a salad with lots of bacon and fat. This is the one! If you look at the photo above, you can see the origins of this recipe and that wicked moment of genius when the cauliflower was cut in favor of a pound of crispy, tasty bacon! Mix Miracle Whip, sugar and vinegar until combined. Add to other ingredients and chill. Great for potlucks and picnics!